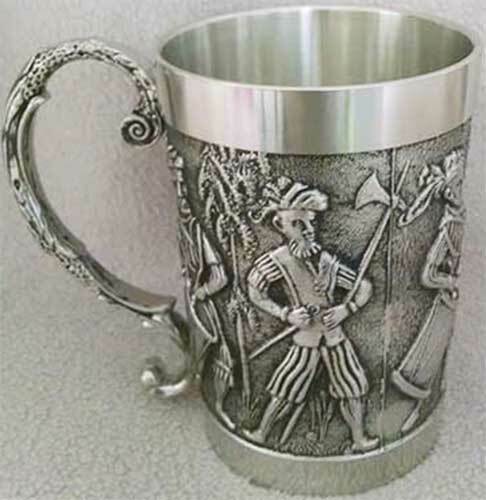 Pewter tankard features a repeated embossed designs of medieval fighting Irish. This Irish tankard is hand-made from lead free pewter. This pewter tankard features an embossed portrayal of medieval fighting Irish. The Irish tankard holds 10 ounces and stands 4" tall; it is further enhanced with an embellished handle. The medieval tankard is hand crafted in Ireland by Mullingar Pewter and it is gift boxed, complements of The Irish Gift House. Pewter goblet features a repeated embossed designs of medieval fighting Irish. Irish tankard is a pewter design that features the life of St. Patrick depicted on embossed panels. Celtic tankard is an Irish pewter design that features two embossed rows of alternating Claddagh and knot-work icons. 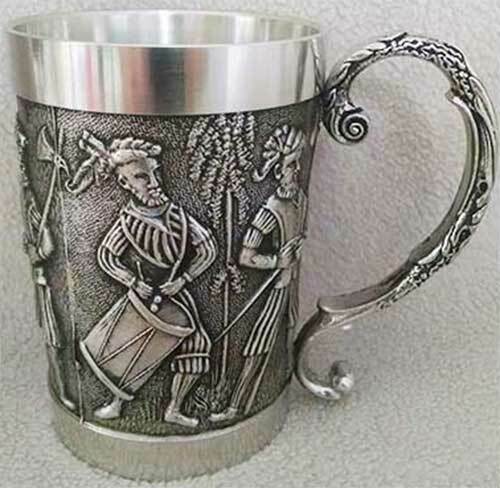 Celtic tankard is an Irish pewter design that features two embossed rows of knot-work.